Featuring: Lily's Theme / A New Headmaster / Statues / Voldemort's End / A New Beginning (with Hedwig's Theme). 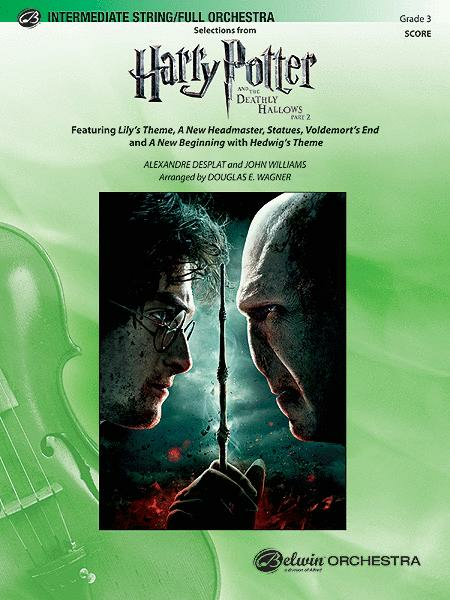 Composed by Alexandre Desplat (1961-) and John Williams. Arranged by Douglas E. Wagner. Full Orchestra; Performance Music Ensemble; Single Titles. Pop Intermediate String/Full Orchestra. Form: Medley. Halloween; Light Concert; Movie. Score. 24 pages. Alfred Music #00-38438S. Published by Alfred Music (AP.38438S). Six key selections from this brilliant score are presented in a solidly scored, emotion-packed arrangement that is designed to flatter your players and please any audience, young or old. Relive the dramatic conclusion to the fabulous Harry Potter saga! Playable by strings alone or any combination of winds.